Alex is also available to provide face to face training and talks. Here are a list of his available talks. Alex is a positive role model who has learnt how to succeed despite the difficulties. He knows what it is to be an autistic teen with all the struggles. This training will help professional to have a better understanding of the young person with autism. Alex uses his experience to provide real world training. We are able to tailor this to your requirements and if you have a particular topic in mind just let us know. Here are some prepared talks that are also available. If you want Alex to combine different subject just get in touch. 1. Autism and anxiety – Alex shares his own experience of anxiety from his early memories when as a child he found the world a terrifying place right up to today where he talks about his own battle with obsessive anxious thoughts. 2. Autism and sensory issues – This talk is about the way sensory issues have affected Alex all through his life. He talks about the early childhood years where clothes were painful right through to how certain noises can still be painful to him. 3. Autism Awareness Training – This talk is a good introduction to staff and carers. Alex has given this talk to college tutors and staff, childminders, social workers, teachers and support workers. Alex can tailor this talk to your particular requirements. 4. Growing up with autism– This talk is aimed at young people who have autism themselves. Alex shares his teen personal experience of always feeling different and wanting to know why and eventually finding out he had autism. This is a positive talk that will help young people who have autism to not feel ashamed of who they are. 5. Autism and me – In this talk Alex gives a humorous introduction to autism and shares some of the ways his life is affected by autism. 6. Autism and medical experiences – Alex gave this talk to a Doctor’s surgery. He shares some of his medical experiences and how medical staff can help individuals who are on the spectrum. 7. Hopes for the future – Alex talks about the things he wants out of life and some of the obstacles that can get in the way. 8. Autism and adulthood – This is a good Autism Awareness Training Session, Alex talks about the help he needs to succeed as an adult with autism. 9. Alex’s Testimony – Alex couldn’t believe in God when he was younger because it’s hard for someone with autism to believe something you can’t see. Alex explains how this changed and how he came to understand the concept of God and forgiveness in his life. 10. Experiences of School – Alex talks about his memories of going to a Special School for two years, and can also talk a bit about being homeschooled. 12. Autism and employment – A positive look at ways in which individuals with autism can make a positive contribution to the work place. 13. 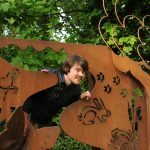 The myths about autism – Using humour and banter Alex challenges some of the most common myths of autism while sharing his real personal experience of living with the condition. 15. Autism and stimming – Alex shares his experience of stimming from an early age. He answers a lot of questions like why he stims, what he is thinking when he stims? Should stimming be stopped or controlled? Is stimmimg a sign of distress? 16. 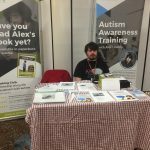 Autism and Obsessions – Alex talks about special interests, he shares how he feels they have helped him to become who he is today. Alex talks about why he became obsessed with the colour blue as a young child and why narrow interests helped him to cope with a frightening confusing world. He also talks about obsessive thoughts & negative fixations. This talk is not to be missed. 17. 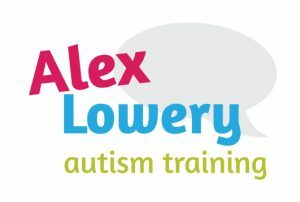 Autism awareness training – Alex and Sylvia are available to provide autism awareness training. This can be in either half or full days and will be an interactive workshops that will enable attendees to consolidate what they have learnt. 18. Autism, ABA and family life – Sylvia shares her personal experience of ABA. 19. ‘My journey with Autism’ A Mum’s experience – Sylvia shares her own experience of Alex’s early years, diagnosis and coming to terms with it. 20. 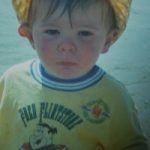 My Childhood with autism – This is a talk about Alex’s childhood, back in the days when he found the world a horrifying place. He also talks about the therapy he received. 21. My disabilities and me – This is a talk where Alex speaks about his autism as well as his other conditions including ADHD and Dyspraxia. He speaks about how each condition affects his others. 22. Making Autistic children feel welcome – Tips and advice on what steps can be taken to help make the classroom a good environment for autistic children. 23. Opening doors. enhancing lives, it isn’t just about ramps. 23. Peaks and pitfalls of the autism adventure : In this talks Alex talks about the experience of growing up and entering into adult life. He covers four main areas transition, education, employment and support. 24. Disability from a students perspective – In this talk Alex shares his personal experience of being a student, that barriers that can get in the way of learning and what has helped. 25. Raising children with SEN – In this talk Sylvia talks about the ups and downs of her life home educating 5 children. 26. Autism and girls – Sylvia talks about the unique way in which females on the spectrum can learn blend in and miss out on a diagnosis and support. 27. Technology and disability – In this talk Sylvia talks about the positive impact technology can have and how it gives support with judgement. 28. Entering the world of work after 22 years of caring and being a home educating mother – In this talk Sylvia explores the challenges of leading the workforce as a carer and how she managed to balance her caring responsibilities with part time paid employment. 29. Martin brother, drug addiction, self harm and enduring mental health – Sylvia talks about her brother, his death from a cry for help that went wrong and how had a diagnosis of Asperger Syndrome in his records was somehow lost. 30. Martin brother, drug addiction, self harm and enduring mental health – Sylvia talks about her brother, his death from a cry for help that went wrong and how had a diagnosis of Asperger Syndrome in his records was somehow lost. Here are some examples of workshops that have been provided for organisations. Get in touch or telephone 01352 719285 to discuss your requirements. I Am Not Alone (Or Gonzo and I Understand Each Other) – Alex gives a personal account of accepting and embracing having autism. Building Survival Skills. – Tips and advice on how to help students on the spectrum succeed and work through anxiety, exams and socialising. 9.30 What is autism? – Alex will give a short talk about autism. 9.45 Anxiety and sensory issues as a child- Alex will talk about his early years and how anxiety affected him. How he was helped to cope with his anxiety. Alex will also talk about sensory issues as a child. 2.00 The positives of autism – Alex shares how his unique way of seeing the world has its advantages. This seminar has been delivered to professionals who include, teaching staff, charity employees and mental health practitioners. How special interests can save lives and can be used to help with depression or anxiety attacks.